450 Beacon is located on the north side of Beacon, between Hereford and Massachusetts Avenue, with 448 Beacon to the east and 452 Beacon to the west. 450 Beacon was designed by Shaw and Hunnewell, architects, and built in 1895-1896 by McNeil Brothers, carpenters, as the home of wholesale wool merchant Edward Nicoll Fenno and his wife, Ellen Marion (Bradlee) Fenno. Edward Fenno is shown as the owner on the original building permit application, dated May 14, 1895, and on the final building inspection report, dated July 9, 1896. Blueprints for 450 Beacon – floor plans and framing plans for the first and second floors, and elevations of the party walls — are bound with the final building inspection report in the collection of the Boston Public Library’s Arts Department (volume 77, page 58). Ellen Fenno purchased the land for 450 Beacon on March 1, 1895, from Annie Hardon (Burr) Farlow, the wife of Dr. John Woodford Farlow. They lived at 234 Clarendon. She had purchased the lot on May 14, 1891, from Frederick Lothop Ames, who also owned 448 Beacon, the home of his son-in-law and daughter, Robert Chamblet Hooper and Helen Angier (Ames) Hooper. Frederick Ames had purchased the land from William Simes on December 13, 1889. It was the eastern 25 feet of a 77 foot wide lot William Simes had purchased from the Boston and Roxbury Mill Corporation on March 15, 1886, plus a one foot wide strip to the east that he had purchased from Frederick Ames on May 16, 1888 (on the same day, they entered into a party wall agreement with respect to any wall that would be built on the boundary between 448 Beacon and 450 Beacon). The one foot strip was part of a 56 foot lot that Frederick Ames had purchased on March 1, 1888, from William G. Saltonstall, who had purchased the land from the Boston and Roxbury Mill Corporation on February 10, 1886. Click here for an index to the deeds for 450 Beacon, including additional information on the deeds and agreements limiting buildings in the rear of the lot. By the 1896-1897 winter season, Edward and Ellen Fenno had made 450 Beacon their home. They previously had lived at 96 Mt. Vernon. They also maintained a home in Falmouth. The Fennos’ three adult children — Henry Bradlee Fenno, a real estate and insurance broker, Edward Nicoll Fenno, Jr., an investment banker, and Marion Hiller Fenno — lived with them. In October of 1909, Hezekiah B. Fenno applied for (and subsequently received) permission to build an automobile garage at the rear of 450 Beacon. This probably was an incorrect reference to the Fennos’ son, Henry Bradlee Fenno. Marion Fenno married in March of 1924 to Arthur Wellington Bell, a former investment banker in Pittsburgh who later would become an author. After their marriage, they lived at 450 Beacon with the Fennos during the 1925-1926 and 1927-1927 winter seasons, but moved soon thereafter to 104 Marlborough. Ellen Fenno died in 1930 and Edward Fenno died in October of 1931. 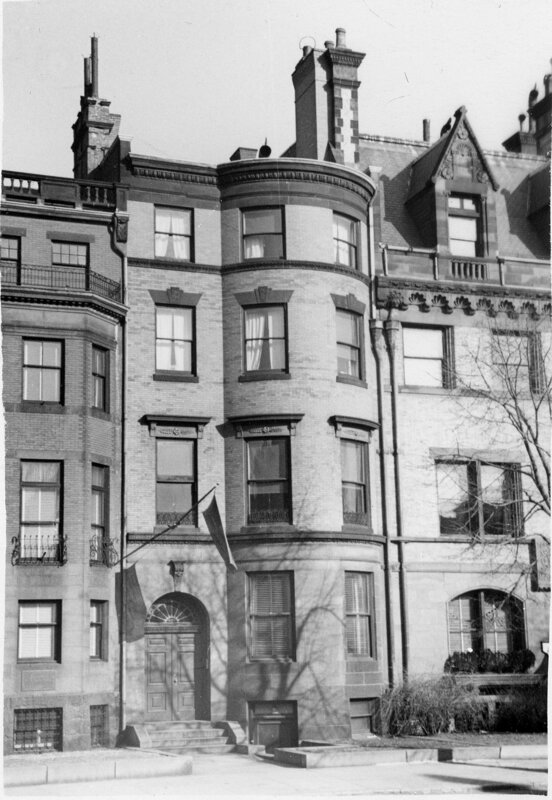 After their parents’ deaths, Henry and Edward Fenno continued to live at 450 Beacon. Edward Fenno married in June of 1940 and they moved to 298 Marlborough. 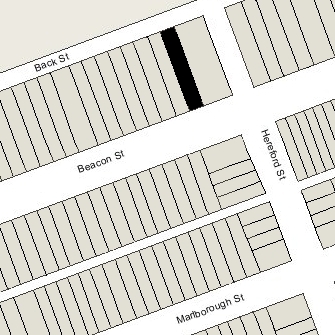 By 1941, Henry Fenno had moved to 351 Marlborough. On August 20, 1940, 450 Beacon was acquired from Ellen Fenno’s estate by 450 Beacon Street, Inc., and became the fraternity house of the MIT chapter of Pi Lambda Phi fraternity. It previously had been located at 71 Bay State Road (as Phi Beta Delta). 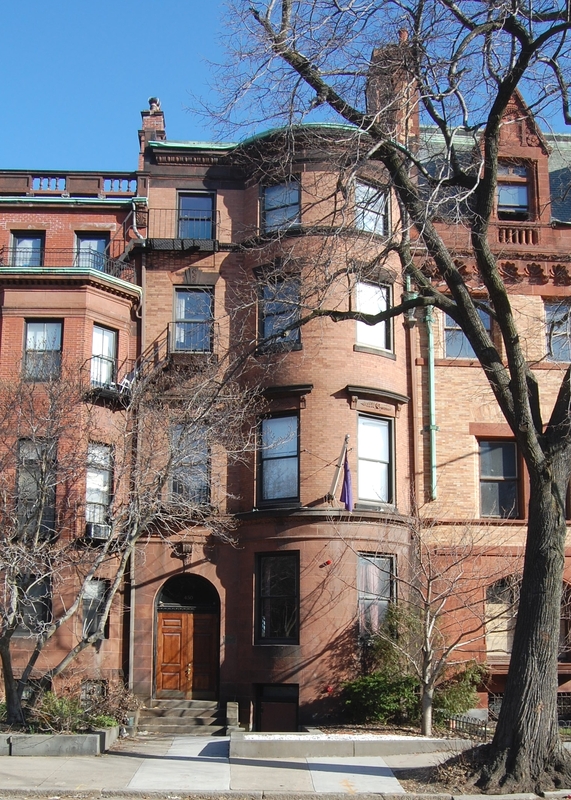 In January of 1943, 450 Beacon Street, Inc., applied for (and subsequently received) permission to legalize the occupancy as a fraternity clubhouse and dormitory. 450 Beacon remained the Pi Lambda Phi fraternity in 2017.